Many people wonder why vets recommend having a once a year check-up for pets. There are many reasons but probably the most important is that the average dog or cat ages by approximately seven “dog/cat years” for every human year. It may differ slightly from breed to breed and usually cats and small breed dogs age slower than large breed dogs. The average life expectancy of a large breed dog is about twelve years whereas cats and smaller breed dogs can quite comfortably live to eighteen years. Just like in humans where the average life expectancy has increased dramatically over the last twenty years because of better healthcare, proper nutrition and a general improvement in living conditions, so has the life expectancy of our pets. Animals which are kept as domestic pets live a much more sheltered lifestyle than their wild counterparts, where there is little protection from natural predators and harsh environmental conditions. Nutrition for pets has also become a much more advanced science than in years gone by and these days it is quite common to find specialised diets for life stages, breed types and conditions. The average quality of life and life expectancy in large breed dogs who suffer from arthritis has been substantially increased because of specialised diets catering for their particular needs. One of the major reasons why the life expectancy of our pets has increased is because of proper parasite control. External parasites like fleas or ticks, which can carry life threatening protozoal diseases like Billiary Fever, are effectively controlled by the use of products specifically designed to kill and control the populations of these parasites. Products used and recommended by vets are highly specialised in their design and millions of rands are spent on making sure these products are safe for our pets and are lethal only to the parasites they are intended to control. Infectious diseases, which at one point in time were considered to be a normal progression of life and which killed many domestic pets, can now be very effectively controlled by vaccination protocols which are recommended and used by vets. There are regional differences in the occurrence of certain diseases and your local vet is the best person to advise you as to which diseases are more prominent in an area and should be more vigilantly protected against by vaccination or other precautionary measures. There are also breed predilections and interactions between breeds where the intelligent application of the correct pro-active care can ensure a long and healthy life for your pet. checking the temperature to make sure that there are no imminent signs of underlying infections or conditions. The list is by no means a comprehensive list of the things the vet may do during the annual health check but touches on some of the important systems which the vet may want to examine during the annual check-up. In most cases the vet will recommend and do vaccinations for diseases which are endemic to the area in which you live and will also do internal parasite control like deworming your animal. You can imagine that if you see your doctor once in every seven years then it will usually be considered a long time between health checks. 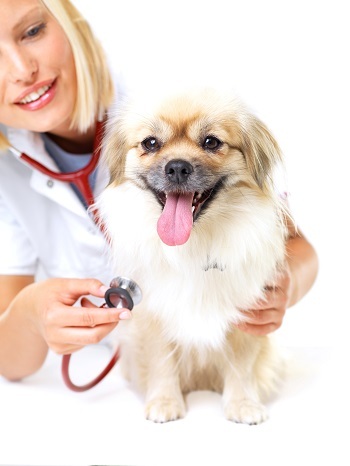 Therefore it is imperative that your pet visits the vet once a year for his or her health exam so that the vet can detect potential problems early and advise you on the correct nutrition and care for your pet.